Shortly after birth Naomi developed AthetoidCerebral Palsy due to severe jaundice, resulting in damage to her basal ganglia located in the mid-brain. She is presently three years old and after many different therapies she can now hold her head up for most of the time, sometimes roll over, and more effectively cough and swallow. 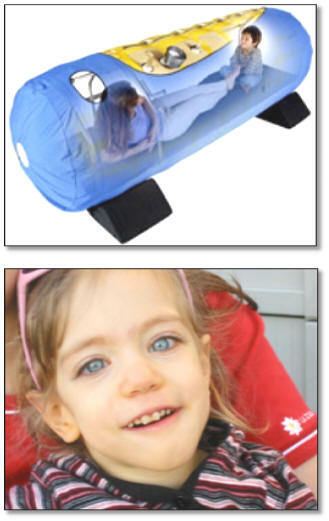 One of the therapies she is using, Hyperbaric Oxygen Therapy (HBOT, helps those with Cerebral Palsy by bringing extra oxygen to damaged brain cells. If this treatment is started early and is done frequently, these dormant cells can begin to function and this contributes to significantly improved CP symptoms. Every three months, Naomi’s mother and her five siblings travel to a clinic for 40 HBOT treatments in 20 days with a cost of $4,000. The family stays in the home of the clinic owner during the therapy while Naomi’s father stays back home to work. HOW TO PARTICIPATE -- GOAL REACHED May 16, 2010! !